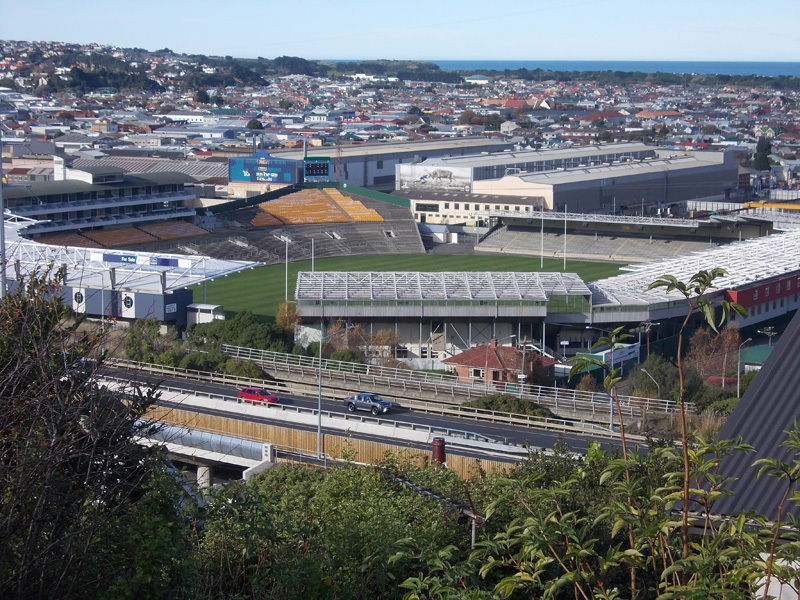 Planning for South Dunedin, but wait…. Wed, 20 Apr 2016 at 8:44 p.m. The floods last year in South Dunedin have provoked discussion as to what are appropriate policies that Dunedin should adopt regarding planning for this area. Concern that rising sea levels as a result of global warming brings urgency to consider this problem. The area is low lying and even a modest rise in sea level may make the frequency of flooding a serious problem at some time in the future, possibly to the extent that the area becomes unviable as a residential area. A rise of 300mm may increase the danger of severe flooding to an unacceptable level. A timely but not precipitate response is required. The cost of the response may be huge in both financial and social costs for the city if a solution such as “a retreat from the sea” is undertaken. But predictions are predictions, they are not yet actual. We are fortunate in Dunedin to have an accurate and reliable record of sea level. Indeed the safety record of our port attests to this. This record indicates that the sea level in Dunedin is rising at the rate of 130mm per century. Figure 1 shows the sea level as measured at Port Chalmers taken from the “PSMSL Data Explorer” http://www.psmsl.org/data/obtaining/map.html. And note that there is no observable increase in the rate of rise over time. At this rate it will be 230 years before a 300mm limit is reached, well beyond our planning horizon, say 2100. However, claims are made that the rate will greatly increase and so pose a threat that we must consider immediately. But note that in order to reach a 300mm rise before 2100 the rate of sea level rise would have to increase by a factor of 270% above that currently observed. It would be irresponsible in the extreme to undertake extreme action without carefully examining the validity of the claims. We must consider if and when a response is required. What reasons do we have to expect such a catastrophic rise? I address four points as to why I do not consider the predictions of catastrophic sea level rise to be well founded. 1) As discussed above, the available sea level data gives no indication of an impending catastrophic sea level rise. 2) Rising sea levels are a claimed consequence of rising temperatures. 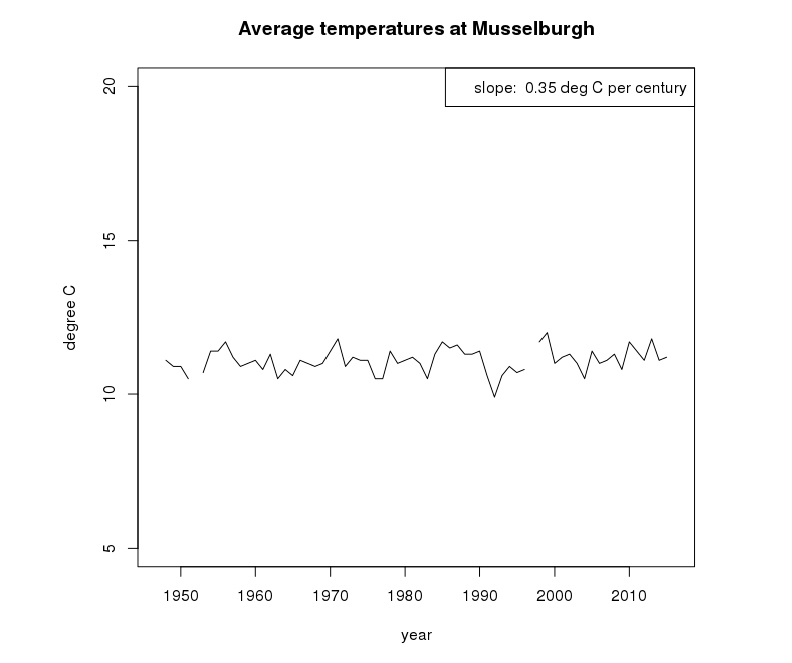 Thus for the prediction of rising sea levels a precondition is that temperatures should be rising. That this should be so is confidently accorded to by the IPCC. However, reality is not quite so simple. Although this is a local measurement and rising sea levels are claimed to be a consequence of rising global temperature, the absence of significant warming and no evidence for any increase in the rate of warming must cast doubt on predictions of imminent catastrophic sea level rise. 3) The track record of predictions regarding climate change does not give rise to confidence in the validity of those predictions. For instance in 2007 the Australian Climate Commissioner, Tim Flannery, claimed that Sydney was “facing extreme difficulties with water”, in 2008 that: “The water problem is so severe for Adelaide that it may run out of water by early 2009.“ and others regarding an endless Australian drought. These claims were influential in the decision to construct desalination plants in Australian seaboard cities at a cost of about $10 billion. His predictions have not come true, the drought broke and the plants have not been needed. This expense is probably not a complete waste as the plants do provide insurance against future droughts which are sure to occur. – from Dr David Viner, of University of East Anglia, who confidently asserted that within a few years winter snowfall will become “a very rare and exciting event”. – and many others too numerous and many too silly to comment on. All these predictions have failed to eventuate. I suggest that we should not take at face value the predictions of claimed experts without corroborating evidence such as trends in the historic record or the success of previous predictions. 4) Sea level rise is largely due to melting of continental ice sheets exceeding their gain from snowfall. This is not an easy measurement to make accurately. It has been assumed that melting exceeds accumulation thus contributing to sea level rise. However, recent satellite measurements by NASA cast this in doubt. In fact they indicate that the opposite is the case. It is critical that we should have a high degree of confidence in the predictions of sea level rise before committing ourselves to very expensive and socially destructive remedial or mitigation policies. The issue at hand is not one of the reality or otherwise of global warming, we need make no commitment on that issue before deciding the fate of South Dunedin. The climate has changed over the millennia and will continue to do so. The issue is the making of a timely and appropriate response to its flooding problems. The points I make above are intended to show that the confidence in alarmist predictions is misplaced and are insufficient in themselves to provide a sound basis for planning. It is clearly unnecessary to address this problem immediately but continued attention is required so that appropriate actions can be taken if the situation is observed to change. 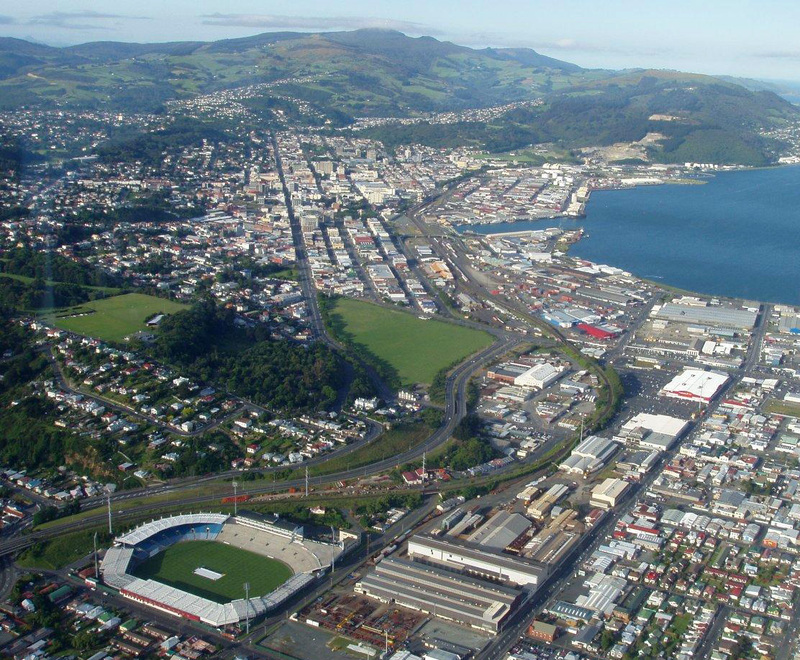 Fortunately in New Zealand the data relevant for making decisions such as that posed by planning for South Dunedin’s future is publicly available and of high quality. Citizens should avail themselves of this the opportunity of consulting the data themselves to draw their own conclusions rather than rely on second hand interpretations. “You don’t need a weatherman to tell which way the wind blows” Bob Dylan. 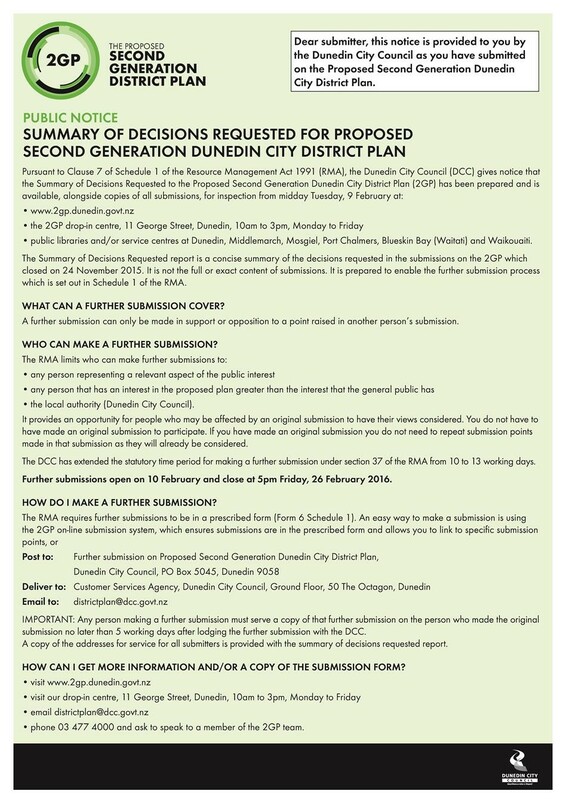 Dunedin City Council has extended the Further Submissions period for the second generation district plan (2GP) to Thursday, 3 March 2016 at 5pm. All members of the public are eligible to make submissions on the Summary of Decisions Requested to the proposed 2GP. Copy of DCC internal correspondence received. Tue, 16 Feb 2016 at 7:01 a.m.
A quick update on the 2GP: we have found a technical issue with the reports that were produced in response to the submissions on the 2GP. As a result the reports need to be reissued and this means that we are outside the 10 day minimum statutory period of the current consultation and will have to re-notify. We are assessing whether there will be an impact on the timing of the 2GP hearings and the remaining consultation process, but it will require us to re-advertise our consultation period. We are updating the website and making sure the necessary adverts are in place. Sent: Monday, 15 February 2016 10:51 p.m. I received the below DCC email on 5 February, and was prepared to make a further submission before the closing date of 26 February 2016. 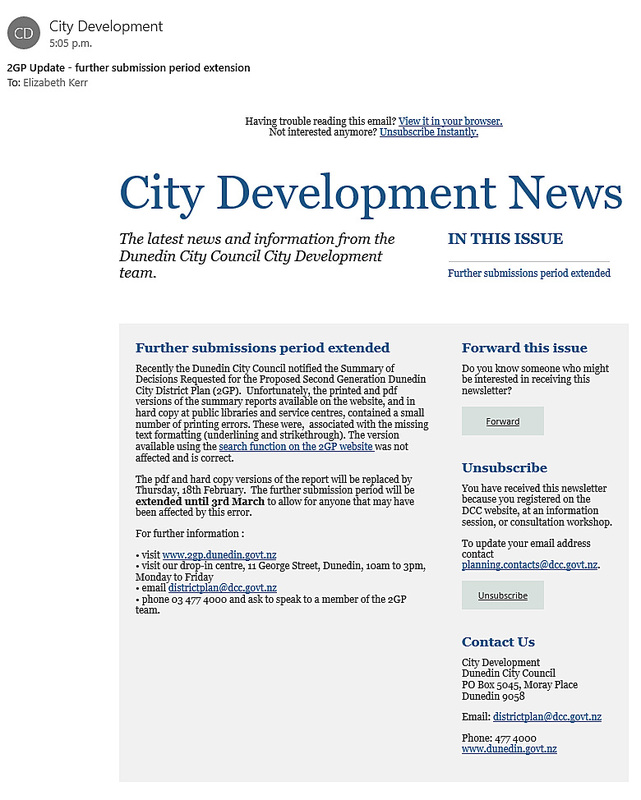 Today, confusion at the DCC website with regards to further submissions – given two updates provided. The Summary of Decisions Requested reports have been temporarily withdrawn from the website due to a technical error in exporting data. In the interim please use the search function on the Search the Submissions page to view the correct Summary of Decisions Requested. Updated Summary of Decisions Requested reports will be distributed online and to libraries as soon as practically possible. This last made no reference to public notification of an extended closing date for further submissions. Given the date of issue was 12/02/2016 this suggests that by now all submitters should have been emailed individually about something having gone wrong with the process and to await further information from DCC. I hope the technical error which affects all those making further submissions is properly recognised and a public notice will be issued that extends the closing date for submissions. Otherwise I imagine the Council will leave itself open to challenge. Please could someone clarify how the process is to presume, and accurately. Sent: Friday, 5 February 2016 3:28 p.m. Please see the public notice for the Summary of Decisions Requested for the Proposed Second Generation Dunedin City District Plan below. It would be appreciated if you contacted the 2GP Team at the times and through the options laid out in the public notice rather than by responding to this email. Mon, 15 Feb 2016 at 5:36 p.m. Last updated 10:59 p.m.
Two updates were issued today by DCC on the 2GP further submission process. In the first, DCC said it had withdrawn the 2GP Summary of Decisions, and the closing date for further submissions would be put back and publicly notified. Awaiting clarification and advice from DCC. IGNORE THIS DATE – The Further submission period is open from Wednesday, 10 February to Friday, 26 February. What can a further submission cover? A further submission can only be made in support or opposition to a point raised in an original submission on the 2GP. Who can make a further submission? 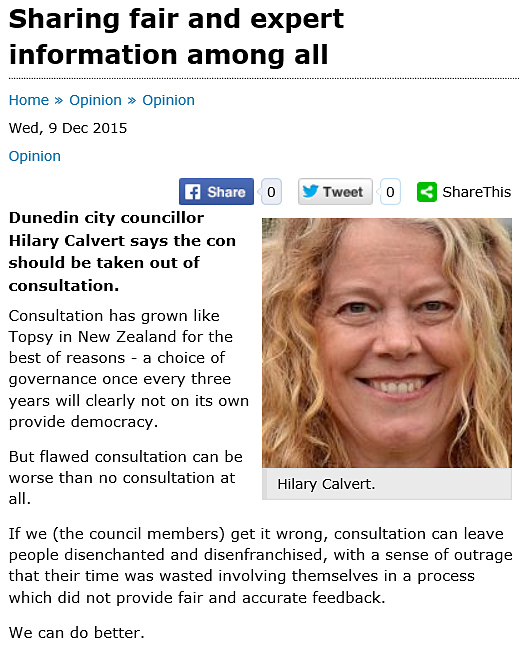 ● the local authority (the Dunedin City Council). It provides an opportunity for people who may be affected by an original submission to have their views considered. You do not have to have made an original submission to participate. If you have made an original submission you do not need to repeat submission points made in that submission as they will already be considered. The Summaries of Decisions Requested are a concise summary of the decisions requested in the submissions on the 2GP which closed on 24 November 2015. It is not the full or exact content of submissions. It is prepared to enable the further submission process which is set out in Schedule 1 of the RMA. █ The Summary of Decisions Requested and copies of all submissions will be available from midday Tuesday, 9 February. ● public libraries and/or service centres at Dunedin, Middlemarch, Mosgiel, Port Chalmers, Blueskin Bay (Waitati) and Waikouaiti. The submissions map indicates the spatial location of submissions seeking a change to the proposed zoning (management zones only not overlay zones), new heritage precincts, or changes to scheduled items. It reflects the information in the submission point address field of the Summary of Decisions Requested reports. Through pop-ups, the map provides links to relevant submissions. DISCLAIMER: This map has been prepared as an aid for people wanting to understand the scope of submissions related to an area. The accuracy and completeness of this information is not guaranteed and people should read original submissions. In some cases, the information contained in submissions was not detailed enough to accurately map the scope of the submission. In these cases, the mapping has been either omitted or approximated where possible. How do I make a further submission? Hard copies of the submission form and submission guidelines can be downloaded below or paper copies can be picked up at the 2GP drop-in centre or from the DCC Customer Services Agency located on the ground floor of the Civic Centre at 50 The Octagon, Dunedin. IMPORTANT: Any person making a further submission must serve a copy of that further submission on the person who made the original submission no later than five working days after lodging the further submission with the DCC. A copy of the addresses for service for all submitters is provided in the Submitter Details Report. █ For more at What if? Dunedin, enter the term *2gp* in the search box at right. Sent: Friday, 18 December 2015 5:40 p.m.
Sue has asked me to email you with regard to the eplan format concerns you raise below. Apologies for the delay – we thought a response had already been sent to you have realised now this is not the case. The eplan is effectively no different from a plan produced in word processing software (like Microsoft Word which was used for the current District Plan). It has the same ability to be printed and annotated by users.. While we do not offer print out of the whole plan, we are providing hard copies of sections on request. The strength of the eplan format is making it easier to allow cross linking between plan provisions to locational information (e.g. search plan from property address), which will be added after the plan is finalised. It does not diminish its usability in print form. 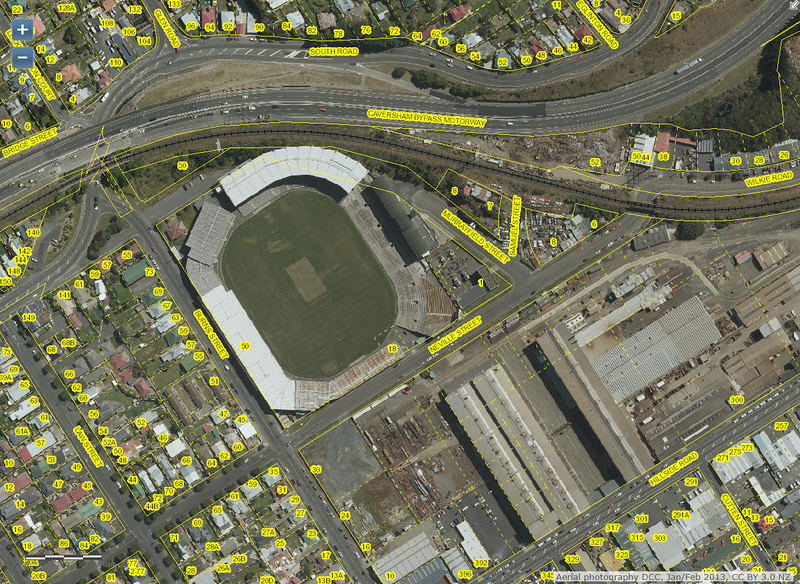 The software used to produce our 2GP in the same system that has been used for the Auckland and Christchurch plans and is being used other councils who are currently working on their 2GPs. It is the new ‘norm’ for plan writing in New Zealand. We have reviewed other District Plans and have found the 2GP is not longer than average. 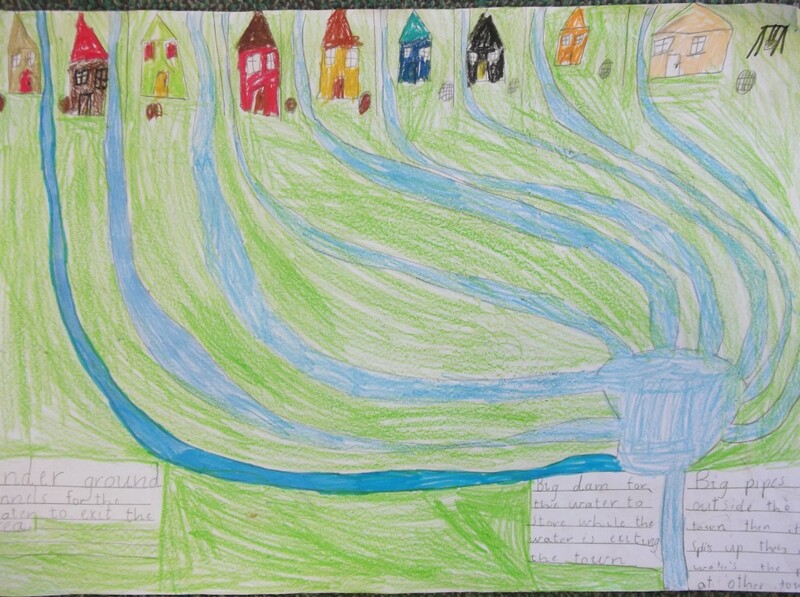 For example, Queenstown’s Residential Section has 68 pages, Christchurch’s has 180 and Dunedin’s has 87. Much of the increased length from the current district plan is due to better cross-referencing between sections. The plan easier to use because it reduces the need to search through the whole plan to see what is relevant to a particular proposal in a particular location (which has involved more repetition of content rather than new content). This means that most people will need to look at fewer parts of the plan. We have received positive feedback from planning professionals who work across several Council’s plans. The feedback is that the 2GP is well structured and easy to use. However, we accept it does take some time to get used to. In additional to providing detailed help information on the website (see guide to the structure of the plan and how to videos) we provide one –on-one assistance to people to help them understand the new plan and most people seem very pleased with the level of help we are offering. We have helped over 1100 people in this way (often with multiple contacts). We invite you to come and see us for more help if you still require it. Sent: Thursday, 19 November 2015 5:12 p.m. Thanks for reply in advance of the public notice at the DCC website today, also appearing Saturday in the local newspaper. For your information I’m not representing anyone other than myself in addressing letters to the Chief Executive on matters to do with the Proposed 2GP. In my letter (below) I reference need for extension as would apply to “the community” (meaning interested public) as a whole. The RMA does not mention an ePlan. The DCC ePLan (1600 pages) launched at us, as we’re well aware, is a horror to deal with for many. In this regard the RMA requirement of 40 working days scarcely seems fair or practical. Months ahead of ‘back and forth’ through appeals with some parties will, I suggest, place ‘workability’ in sharper relief for the city council. I look forward to what unfolds. I appreciate your clarification provided for submitters around extensions. This is proactive. Sent: Thursday, 19 November 2015 3:32 p.m. Please find attached a response to your email to the CEO. Sent: 11 November 2015 5:41 p.m. I note the closing date for public submissions has been set as Tuesday, 24 November 2015. Due to the length (1600 pages) and comprehensive nature of the planning document (by ePlan), in that it no longer resembles the current Dunedin City District Plan at all, I request that the closing date for public submissions is extended into the 2016 new year. This will allow the community to consult itself, the city council, and experts where need, more fairly and comprehensively than has been possible in the time since notification on Saturday, 26 September 2015. It’s of collective mutual interest to enhance and facilitate the public’s understanding of the document and its likely effect(s) on physical, cultural and political determinants for sustainable management of our environment and resources. This means allowing more time for initial submissions. █ For more enter the term *2gp* in the search box at right.